Home / Whitby / German Comfort Food Straight out of....Whitby? 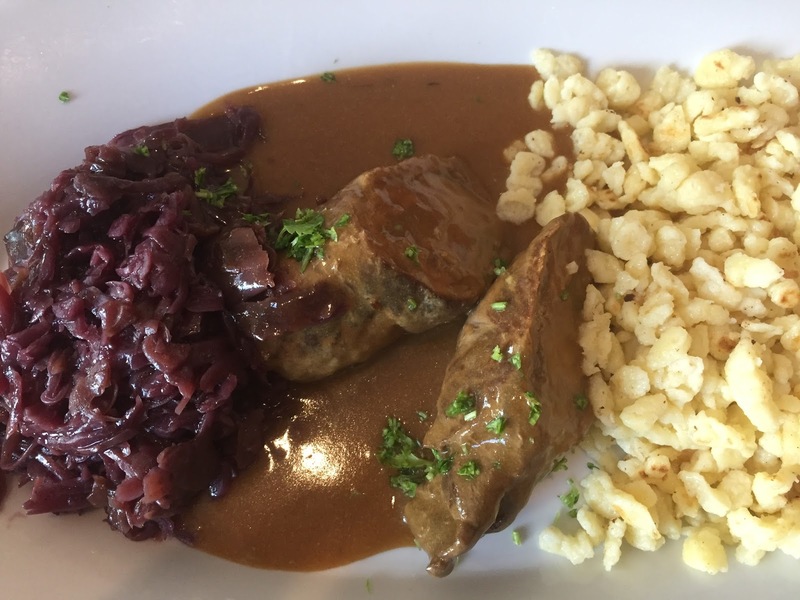 German Comfort Food Straight out of....Whitby? Whitby has so much to offer, was there something I've missed? Yes, I did! 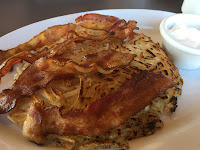 Wolfgang's on Brock serves up German fare and I was excited to go. It's located north of Rossland on Brock in a small plaza. It is a large, inviting space with lots of windows and natural light. The menu is even more inviting. They offer many German dishes as well as Canadian eats. I was there twice; for breakfast and dinner. I really couldn't tell you much about German food before this! At breakfast, I had to ignore my affinity for Eggs Benny and get something else. It wasn't easy, but I went with the Bauernomlett. It was hearty! 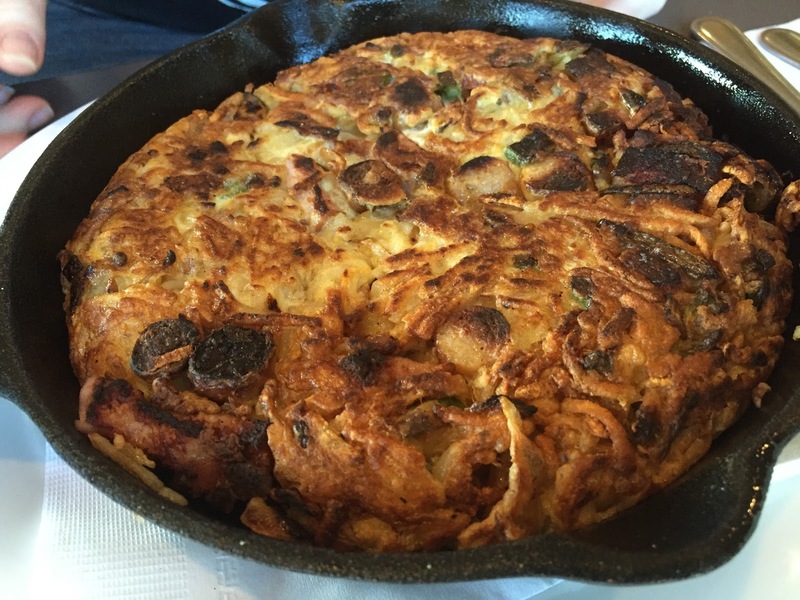 It was 4 eggs, onions, potatoes, sausage, peppers and bacon served with rye toast. Woah! Talk about a food coma! My friend got the Breakfast Rosti. It was a mound of shredded potatoes topped with bacon. Tasty! If you're going for dinner, be prepared: it's big. 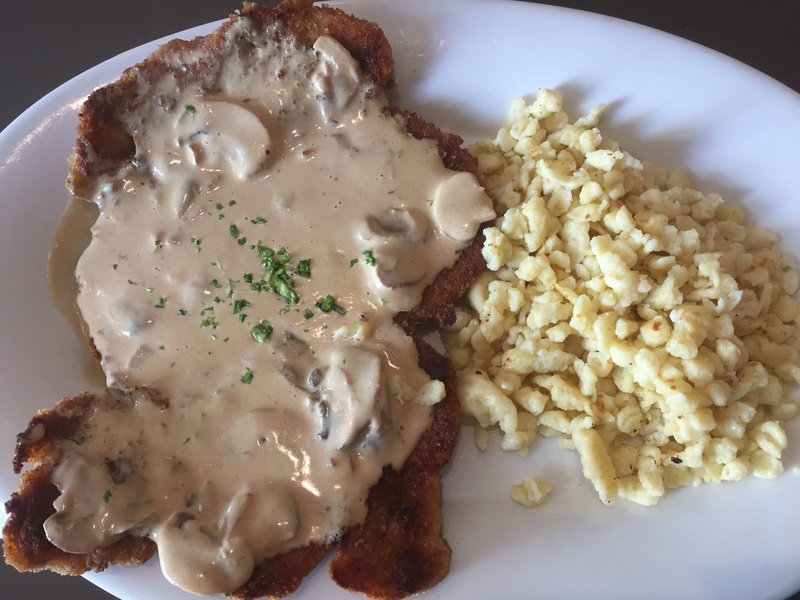 There's 200% chance the schnitzel will be bigger than your face. The looks of shock and amusement will entertain you when you see other tables being served their giant schnitzels that sometimes hang over the side of the plate. They offer many different toppings, but I went with the Jager Schnitzel, because I love me some creamy mushroom sauce. I don't mean the sauce was just creamy, I meant it's MADE with cream. Thick and rick, it's a nice compliment to the crispy, light batter of the meat. I wish they had put it all of the spatzle. Not sure what spatzle is? It's mini noodle dumplings, not a lot of taste, but they are carb-tastic. My stepdad got the Rouladen. It's thinly sliced beef, caramelized onions, diced pickles and bacon rolled and braised. He liked it, but not the pickles. It's an unexpected addition! Service on both visits was good. The place is clean and decorated with local artists' paintings that you can buy. A great place for comfort food!